Well the Blue Swimmer crab (or Portunus Pelagicus) is part of the Portunidae family which also includes those sensational eating mud crabs. The widest part of the crab, the carapace or shell, can grow up to 21cm and their claws can have a span of up to 80cm. They can weigh up to a kilogram. As their name suggests they are very good swimmers and their last two “legs” act as paddles.Males have a narrow pointed tail flap on the underside of their shell where as a female has a wider, more rounded flap. Males also have blue elongated pincers whilst females have shorter grey/brown pincers. In the autumn months the male crab begins to court the female for four to ten days by carrying her beneath him and fighting any other crab that comes near. Apparently the male assists the female in molting her shell and turns her over to mate when she is still soft shelled. Afterwards he still protects the female for another three or four days to allow her shell to harden before dumping her and chasing other female crabs. Interestingly the female retains the sperm until the following summer when her ovaries are fully developed. 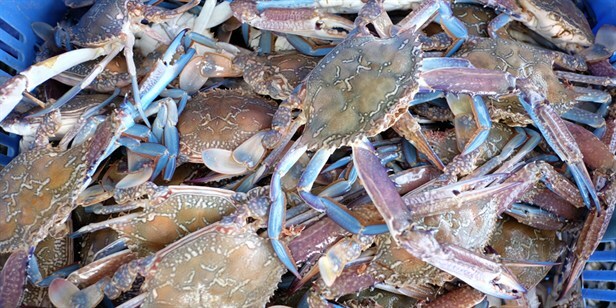 This could also explain why most fisheries compel fisherman to release all female crabs regardless whether they appear to be carrying eggs or not. A female blue swimmer crab will produce between 180, 000 and two million eggs and carry them on her abdomen. Such a crab is said to be “berried”. The eggs will change from orange to black and will be incubated for about 18 days. The female will shake away the mature eggs which hatch into what is known as “zoea”. These float in the tide for four to six weeks and can be swept up to 80km out to sea. Most fall prey to other marine creatures but a small percentage make it to shallow nursery areas where they grow and moult numerous times before becoming the size of a 10c coin and taking on the shape of a crab. At this stage they are known as Megalopae and each time they moult they can increase their size by 20% and their weight by as much as 80%. By autumn they are between 3 to 6cm in width and by winter they are at least 9cm wide. The winter months slows down their growth and before their last moult the females will mate with a male for the first time and start the whole cycle off again. I am always amazed at the amount of male blue swimmers that are caught as opposed to females. I estimate that it’s probably in the ratio of 10 males to one female. This may be because the females are “busy” with their male partners whilst the males are more likely to be out foraging for food. Please read our General Disclaimer.